This Easy Fish Pie is inspired by the classic British dish. It’s loaded with flaky salmon, tender veggies, and topped with creamy mashed potatoes for an easy dinner option! So instead of packing my bags, I’ve been indulging my taste for culture and adventure with food! In light of the recent royal wedding (congrats, Harry and Meghan! ), I’ve been thinking a lot about last year’s trip to London and a few memorable dishes of hearty English comfort food. On a drizzly day, there’s nothing like ducking into a hole-in-the-wall pub for a pint and a hot meal. Wanting to recreate that warm and flavorful feeling in my own kitchen, I used Gorton’s Simply Bake Salmon (it was already in my freezer!) to inspire a recipe for British Fish Pie. If you’re not well-versed in British comfort food, many favorites are centered around bread or potatoes, and some kind of protein. 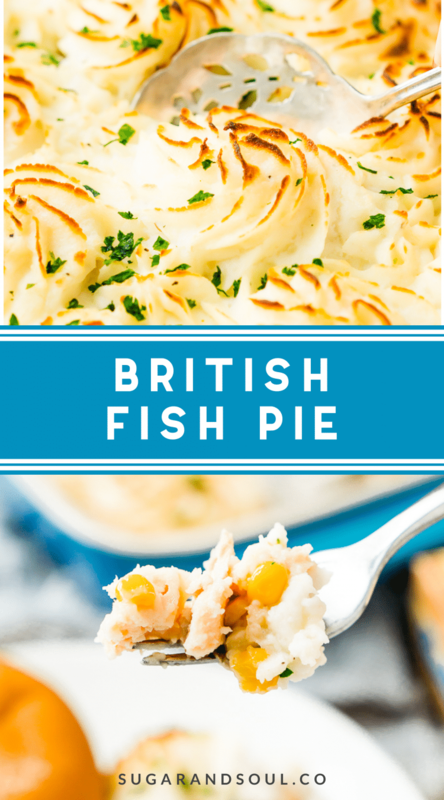 To give you an idea, both shepherd’s pie and fish and chips are two classic dishes from the United Kingdom that are well known here in America. In the past, I’ve been honest in saying that I’m particular about my seafood, but since Gorton’s hooked me in with their breaded Skillet Fresh Tilapia, I’ve been trying all their different varieties. It’s no surprise that this company is still flourishing after a 167-year run, and I prefer their products, which feature the iconic yellow slicker-clad fisherman, for a couple reasons. First of all, Gorton’s makes it convenient to eat seafood, and incorporate it into recipes, any day of the week. Second, all of their fish is filled with fresh-caught flavor, and they pride themselves in providing families with food that’s top-quality. 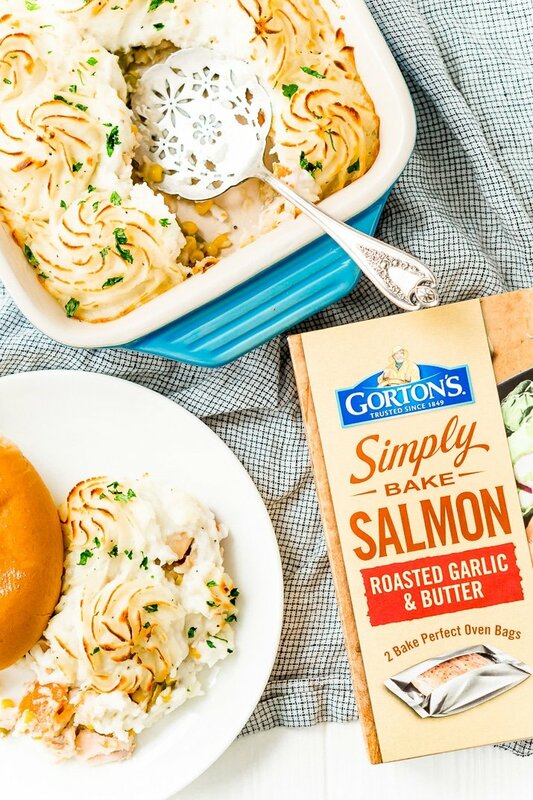 When it came to making my British Fish Pie, I knew that Gorton’s Simply Bake Salmon would be the perfect key ingredient. 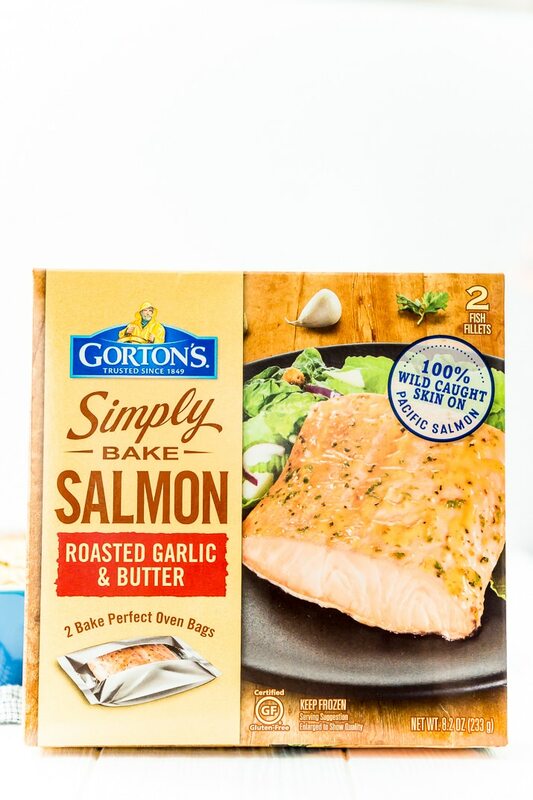 Impeccably seasoned with garlic and butter and ready to cook in its Bake Perfect Oven Bag, it’s the easy and mess-free way to enjoy salmon any time, in any meal. 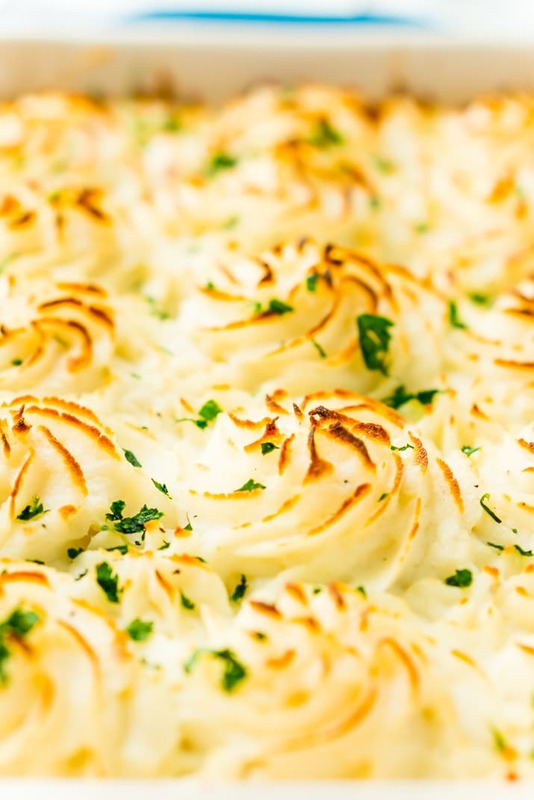 In addition to bringing me back to the land of double-decker buses and afternoon tea, British Fish Pie is a wonderful way to relish some of the season’s tastiest vegetables. 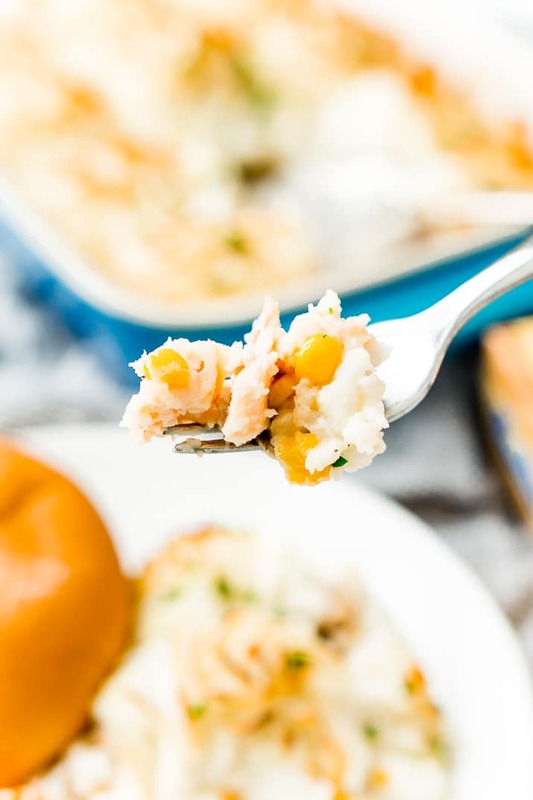 In my opinion, carrots and corn on the cob bought at the local farmer’s market make the best ingredients to complement the fresh taste of Gorton’s Simply Bake Salmon, but canned is usually easiest for a quick and easy weeknight dinner. As I travel the world by plate rather than plane for the next few months, I’ll continue keeping a box or two of Gorton’s products on hand for quick and delicious recipes. In all my kitchen adventures, I’ve found that nothing compares to the fresh-caught taste and unparalleled convenience of everyone’s favorite slicker-wearing fisherman! 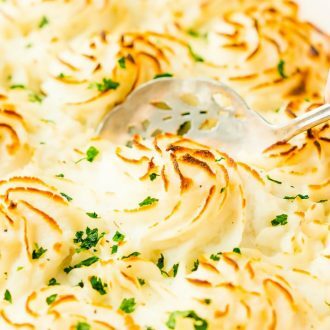 Pin this Fish Pie Recipe for Later! This Easy Fish Pie is inspired by the classic British dish. 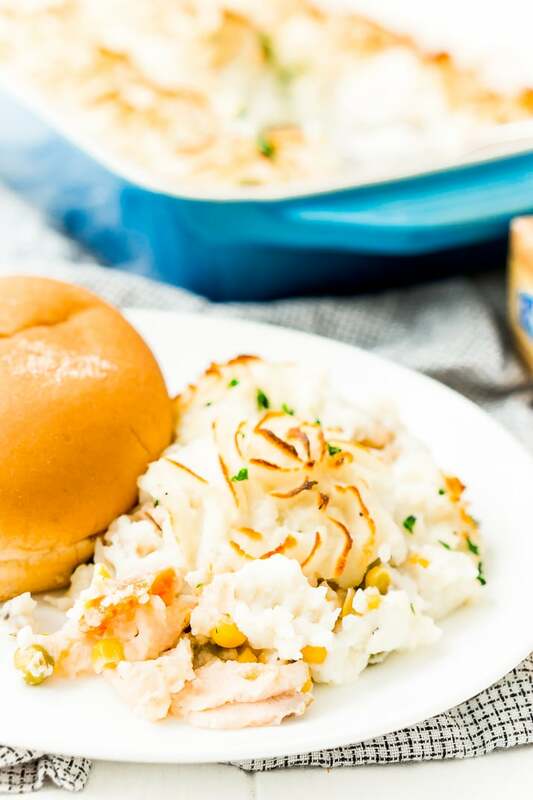 It's loaded with flaky salmon, tender veggies, and topped with creamy mashed potatoes for an easy dinner option! Bake the salmon according to package instructions, after cooking remove the fish and discard the Bake Perfect Oven Bags and extra juices. Remove the skin from the fish and use a fork to tear the salmon up. 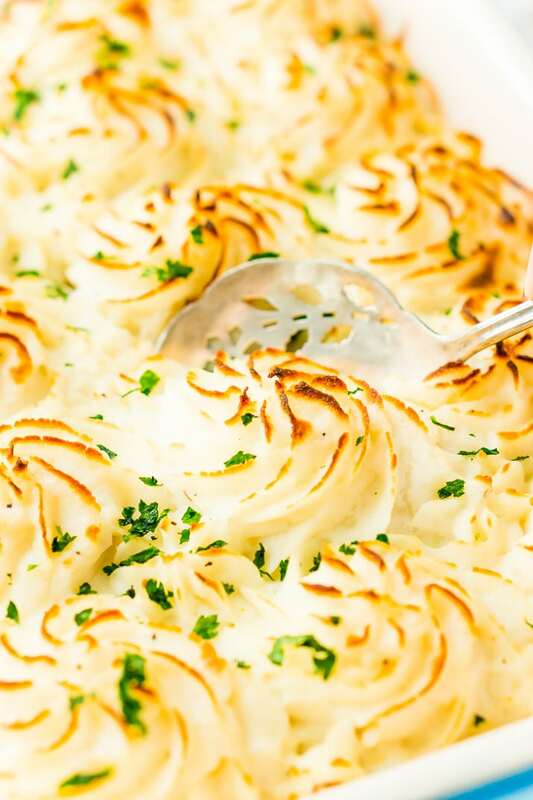 While the salmon is baking, begin making the mashed potatoes. In a large saucepan, create a roux with butter a flour by stirring it together until thick, slowly add the cream and stir for 1 more minute. Add the fish, vegetables, salt, and pepper to the roux and toss to coat. Transfer the fish and vegetable mixture to a 9x9-inch baking dish. Pie or spread the mashed potatoes on top of the fish and veggie mixture and bake for 30 minutes at 350 degrees F. If you like your potatoes a little crispy on the top, broil on love for the last few minutes. Storebought or instant potatoes may be used in place of homemade.